If at first you don’t succeed, try, try again. Kira first competed in 2014 as an intermediate and came 3rd, she came second in the Senior’s in 2016 and last night won the Senior’s section and was crowned overall winner of the YMY competition to receive the Brian Wood Trophy. 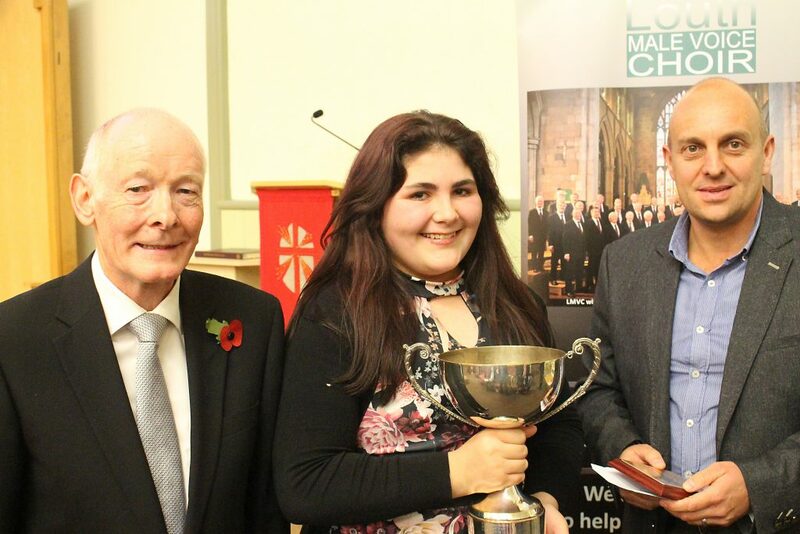 2nd – Libby Challans (Voice), Libby also competed last year when she was again 2nd. Graham Burrell our MD and Head of Music at Cambridge Park Academy, Grimsby, together with Janet McKee our retired accompanist, were the adjudicators. Graham critique of each performances as always was exponing both the good and not so good. He makes a point of being positive but also instructive. It was very pleasing that one of the contestants, not at their best, who had problems with the backing track and microphone, did not blame the equipment but her choice of songs and has told us their positive plan for next year. Such a welcome change from the ‘blame society’ that the kids grow up with today. Encouraging that that young person believes not everyone is equal and in life you have to compete. Malcolm Kerridge has again done a superb job in running the competition spending a great deal of time and effort in getting it all together. John Hards, our assistant MD, gave the introductions for all the contestants in a very professional manner, adding his very knowledgeable comments about the music. Special thanks to Councillor Adam Grist, for presenting the prizes and giving the audience a positive feedback at the end. I am sure next year’s competition will be just as good. The competition has developed over the last few years into the premier even for many young Musicians in East Lindsey and now the surrounding area. At the same time, it has preserved the original concept, which was to encourage and stimulate a love of performing music and to create a relaxed and friendly atmosphere in which all would feel happy to compete. The annual competition is held on a Saturday in November each year. Applications are welcomed from instrumentalists, vocalists and ensemble both orchestral instruments and voice, and must be submitted by the end of October. The competition is open to young people under the age of 18 on 31 August who either reside in or attend a school in Lincolnshire. The competition is divided into three age group: Junior, under 11 years of age; Intermediate, under 14; and Senior, under 18. The format is for preliminary rounds to take place during the morning and afternon sessions, at which every entrant receives valuable feedback from the adjudicators. The three finalists from each age section perform at a concert in the evening. Whilst the adjudicators are making their making their judgements the audience is entertained by a previous winner of the competion.